Back in the 1990s, Beanie Babies were all the rage. People were willing to spend a lot of money on the small, stuffed animals, thinking the value of the toys would only increase as time went on. Ultimately, the craze ended and people found themselves with rooms full of nearly worthless stuffed animals. Home value works in a similar way. When houses in a particular area are in demand, the amount people are willing to pay for a home jumps. The fewer houses available on the market, the higher the perceived value of a house and the more you can sell it for. The opposite is true, as well. When there are a lot of houses available, or when people aren’t in the mood to purchase a home, the amount you can realistically expect to get for your property drops. But it’s not just supply and demand that influences the value of a home. Knowing the other factors that contribute to the price and market value of a property will help you determine how to value your house when you want to sell it. What Is Home Value and Evaluation? The market value of a home is simply the price that someone is willing to pay for your house if you were to put it up for sale. Often, the value of a house will be different depending on who you ask. As the owner of the home, you’re likely to value it quite highly. A potential buyer might take a look around and assign it a lower value. Finally, a home appraiser — someone whose job it is to evaluate homes and assign them a monetary value — might give your home a completely different value. In an ideal world, the amount you believe your home is valued at, the amount a buyer values it at and the value a home appraiser assigns it, will be within close range of each other. Home values are constantly in flux, since the market is always changing and the condition of your home can evolve and change over time, too. Let’s take a look at a few factors that affect the value of a home and what you can and can’t do about them. Location plays the biggest role when it comes to determining the value of your home. When people purchase a house, they aren’t just buying four walls and a roof — they’re purchasing a lifestyle. Where the home is located helps them determine whether or not they’ll get to enjoy the type of lifestyle they want. For example, a home buyer with younger children might be concerned about their ability to play outdoors safely. A house on a cul-de-sac, with a large backyard, is going to usually be more valuable to that buyer than a yard-free home located on a busy roadway. Amenities near your home will also affect its value. If your home is a near a train station or other public transit station, it will often have a higher value than a home that doesn’t have easy access to transportation. Homes in mixed-use communities that have transit nearby generally have more stable home values than houses in more traditional developments. It’s also possible for the businesses and amenities near your home to negatively affect its value. While being located near a grocery store, a coffee shop and a post office will help boost your home’s value, being located near businesses that tend to have a less than savory reputation, or near warehouses and industrial buildings, can lower your home’s value. And although people often want to be near transit, being near an airport often has a negative effect on the value of a home, too. You’ve probably heard it said that “it’s what’s on the inside that counts.” That cliché is true when it comes to the value of a home, for the most part. Although there are buyers out there who don’t mind a fixer-upper, most people are willing to pay more for a well-maintained, move-in-ready home. h to get rid of outdated wallpaper or to spruce up the cabinets in your kitchen. Even a major renovation project can be worth your while when it comes to boosting the value of your home. While you won’t get back the full cost of renovating or remodeling an out-of-date bathroom or kitchen, it’s possible to recoup a fair amount of your expenses. The average bathroom remodel cost $17,908 in 2016. The average homeowner was able to recoup $11,769, or nearly 66 percent of the cost. A major kitchen overhaul cost an average of $59,999 in 2016. Homeowners are typically able to recoup $38,938, or nearly 65 percent of their expenses. Ideally, the renovations you make to a home will have nearly universal appeal. Still, there’s a big risk in custom-designed home renovations. The more your home’s interior is designed to suit your tastes, and your tastes only, the lower its perceived value will be. And it’s not just the upkeep of the house that matters. How it’s arranged, and its size, are also important factors when it comes to determining its value. Often, the more bedrooms and bathrooms a house has, the higher the price it can get. People are usually more interested in having room for a guest room or enough space so that each kid can have his or her own bedroom than they are in having one giant master bedroom. Most home buyers are like Goldilocks. They don’t want a house that’s too big, and they also don’t want a house that’s too small. Owning either a 3,500-square-foot McMansion or a 350-square-foot tiny house is going to mean a lower overall home value, no matter what’s inside or where the home is located. Every home has its story, and some houses have better stories to tell than others. If your home has ever caught on fire, flooded or otherwise been the victim of a disaster, that will potentially lower its value. Even if you made all the necessary repairs, people will be wary about the structural damage to a house caused by flood waters or fire. Plus, if it happened before, people are going to be concerned that it will happen again. In some cases, events that occur in your house, but don’t actually affect the quality of the house, can still lower its value. For example, a “non-natural death” in a house can cause its value to drop by up to 25 percent. The information about a house that a seller has to reveal to potential buyers varies from state to state. In Pennsylvania, a seller needs to disclose whether the house has had water damage and termite problems, for example. PA law doesn’t require you to tell a potential buyer about any negative events that don’t directly impact the home’s structure or quality. But depending on how well-known certain events are, it’s likely a potential buyer will find them out on his or her own. What has gone on in the world around your home can also influence its value, both positively and negatively. If your neighbors are all selling their houses and getting top-dollar for them, it will be easier for you to get a high price for your property. But if something bad happened in your area, such as a crime wave or a major employer closing down, and people are fleeing in droves, that will have a negative effect on the value of your property. A lot of foreclosures in your area will also bring home values down. Negative events can be difficult to bounce back from, even years or decades later. Your neighborhood might be safe now, but if it was known for having a high crime rate once upon a time, that history can still be reflected in the value of its properties. If your house is a square peg that’s surrounded by round holes, that can also have an effect on its value. It can be difficult to judge the value of a single-family home when it’s surrounded by attached houses, for example. It can be tough to say how much a modern house is worth when it’s the only new property on a block full of historic homes. Homes that don’t match up with other properties in the area are often valued lower, which can make it difficult to get a good price when you’re trying to sell. How Do I Know How Much to Sell My House For? There are two main ways to figure out how to price your home. Online home value calculators give you a ballpark figure to use for free. They can be a great starting point to see if the value of your home lines up with what you hope to get from a sale. Another option is to work with a real estate agent and an appraiser to determine a fair value for your home. Usually, agents look at what are called “comps” — that is, similar homes in the area that have recently sold. If you own a 1,000-square-foot home, knowing that one person paid $150,000 for a home of the same size a block away and that another person paid $200,000 for a same-size home down the street can help you choose a price that’s in line with buyers’ expectations and with the general market in your area. Appraisers use a more comprehensive list of criteria when determining the value of a home. An appraiser looks at comparable home sales in the area, as well as the history of the site of your home, any improvements you’ve made to the property, the neighborhood itself and the sales history of the home. What Makes a Comp a Comp? Since very few houses are completely identical, it can be difficult to know whether the house you’re comparing your property to is actually a comparable property. 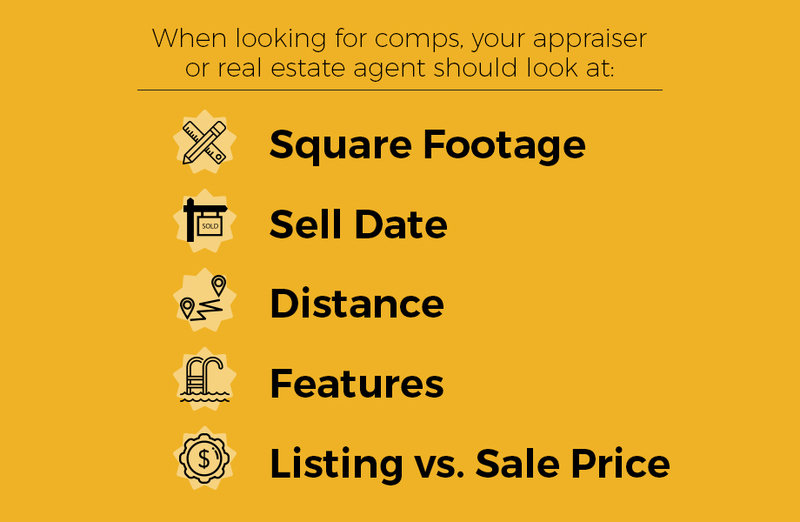 There are a few criteria that your appraiser or real estate agent should look at when looking for comps. Square footage. A comp doesn’t have to been the same exact size as your property. But it will be within the same general range, usually between plus or minus 15 to 25 percent of the size of your home. If your home is 1,000-square-feet, comparable homes can be between 750 and 1,250 square feet. Sell Date. The age of the sale matters, since the real estate market changes so quickly. A sale that happened a year ago is most likely too old to serve as an accurate comparison. Ideally, comps will be less than three months old. If there aren’t many home sales in your area, you might need to look at comps that are up to six months old. Distance. The closer the homes are to your home, the more accurate the comparison will be. Generally, homes should be within a mile or half-mile radius of your home. If you live in an area where homes are more scattered, you might need to expand your radius considerably. Features. A home with a fancy new kitchen and swimming pool is going to have a higher value than a home without a pool and with an older kitchen. Look at what’s inside the homes when making your comparisons. Ideally, the properties will have the same features and amenities as your own, or as close to the same as possible. Listing vs. Sale Price. It’s helpful to see what people hoped to sell their homes for and what they actually got for the sale. That way, you can see if the determined value of the home actually lived up to what it was worth on the market and avoid making a similar mistake yourself. Figuring out the value of your home is just the first step towards putting it up for sale. You don’t necessarily want to list your home for its exact value. Instead, you want to list it a price that will attract the most buyers and will make it easier to sell your property. You might not want to hear this, but it’s often better to price your home on the lower end of a pricing range than on the higher end. There are a few reasons to do this. For one thing, if your home is valued at $260,000, but you list it at $249,000, you’re likely to get more buyers interested in it. You’re able to reach buyers with budgets below $250,000, as well as deeper-pocketed buyers who might be after a bargain. The more people who are interested in your home, the more likely it is that there will be a bidding war. That means buyers can potentially drive up the price of your home in an attempt to outbid each other. Pricing your home on the lower end also makes it easier for people to find when they’re doing a search online. A house priced at $260,000 won’t show up if a buyer sets his or her upper price limit at $250,000. But that same house will show up in the search if you price it at $249,000. The quicker your home sells, the better. Some sellers make the mistake of assuming they can always slash the price if a house doesn’t move fast. While that’s true, cutting the price and having a house sit on the market for a long time raises doubts and questions in people’s minds. A potential buyer is going to be more likely to wonder what’s wrong with the house, or why you lowered the price, and might be less inclined to check it out. That said, it’s still a good idea to have a plan for the price of your home. If buyers don’t flock to your property and get into a bidding war over it, what will you do if your home is still on the market after a month? You might need to cut a bit off of the price, which can sting, but only if you didn’t plan for it in advance. What are the values of homes for sale in York, PA right now? Home values in York have been fairly consistent over the past year, with the median sale price holding steady at $141,450 from October 2016 to January 2017. The median home price in York is considerably lower than the national median, which was $234,900 in November 2016. The average price per square foot in York, PA was $87 in 2016, an increase of 1 percent from the previous year. Meanwhile, the median rent in York, PA from December 2016 until January 2017, was $995. What’s your home worth? Use the home value calculator from CENTURY 21 Core Partners and find out today. Whether you’re getting ready to sell or you’re just curious, knowing the value of your home can help you put together a plan for the future.